On Wednesday, 26 March 2014, Sisters travelled to Sydney from Melbourne (Victoria), Bathurst and Newcastle (New South Wales) to join over one hundred Mercy Sisters, staff, Board members and Associates in the Sydney region, from the three Congregations - ISMAPNG, North Sydney and Parramatta - gathered at the Lidcombe Catholic Club for the last of the presentations given by Mary Reynolds rsm on her current Australian visit. There was a great buzz of energy and anticipation in the coming together. Some had memories of Mary’s stimulating presentation on the life and mission of Catherine McAuley on an earlier visit to Parramatta in 2009, and news filtering through from the gatherings with Mary in other centres in Queensland, Adelaide and Canberra was very positive. Editor: Mary Reynolds rsm has made available for publishing on the mercyworld.org website the papers she gave while in Australia. Over the next few weeks, these will be published in the Spirituality section of the mercyworld.org website with a link from Mercy E-News. We begin this week with Catherine McAuley and the Ministry of Mercy. Mercy International Association welcomes the news that President Barack Obama and Pope Francis in their historic first meeting at the Vatican on Thursday, 27 March, agreed on a 'common commitment' to eradicate human trafficking. Image: MIC. Book: The Rule and Constitutions of the Religious Sisters of Mercy Illuminated by: Clare Augustine Moore. 'The Book of Flowers', one of Clare Augustine's most celebrated works. (circa1856) can be viewed online. As a Mercy community we pray with those in need of prayer. We especially pray this week with the intercession of Catherine McAuley for those whose names are newly added to our prayer list: Anne, Anita, Adele Williams and all who have asked for prayers. Readers of the plain text version of Mercy E-news are encouraged to switch over to the in full colour, with images version (the HTML version). Reading the HTML version of Mercy E-news is more enjoyable, more interesting and more informative because the pictures do convey a thousand words as the saying goes. To change your subscription from plain text to HTML, contact the Editor. The fourth Mercy International Association Soup & Substance Lenten Lunchtime talk took place on Wednesday 26 March 2014, when Tanya Ward, Chief Executive of the Children’s Rights Alliance presented ‘Protecting Children From Exploitation’. Tanya, who joined the Children’s Rights Alliance (CRA) as Chief Executive in January 2012, has much experience in the area of human rights, having worked with the Irish Council for Civil Liberties (ICCL), the Irish Centre for Migration Studies and the Irish Refugee Council. On 25 March, the Australian Federal Government Minister for Justice, the Hon Michael Keenan MP, announced that he has approved funding for ACRATH of AUD$360,000 over the next three years. ACRATH is one of 4 organisations who work closely together who were funded for their work in this area. “Australian Catholic Religious Against Trafficking in Humans (ACRATH), Anti-Slavery Australia, Project Respect and Scarlet Alliance are specialists in their fields and work tirelessly to prevent human trafficking and slavery by identifying people who are in need of help, and providing ongoing care and support to those who have experienced extreme exploitation,” Keenan said. Anne Tormey rsm, President of ACRATH affirmed the Minister’s announcement saying, ‘ACRATH is delighted to receive this funding which will further enhance our capacity to undertake the work we began 9 years ago’. Four Sisters of Mercy were among the Religious leaders from diverse faiths, all members of ARCC (Australian Response to Climate Change) who converged on Canberra, Australia's national capital and seat of her Federal government, on 25-26 March to collectively challenge Australia to do its fair share in solving the climate crisis. ARCC's positions on coal, the repeal legislation and adaptation financing are polar opposites to those of the government led by Prime Minister Tony Abbot. ARCC members met with the nation’s leaders, including Environment Minister Greg Hunt, to make their views public and held a multi-faith prayer vigil outside the Minerals Council Headquarters to challenge the legitimacy of coal, both as an export industry and for domestic energy generation. Mary Tinney rsm was among the ARCC members who made the journey. Her report and invitation to take action, is linked to this item. 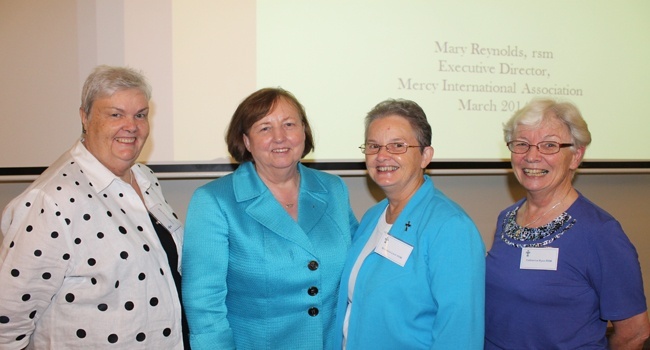 'Last summer the Sisters of Mercy established the Mercy Education Collaborative of Cincinnati (MECC), a partnership between its two sponsored high schools in the city – McAuley High School in College Hill and Mother of Mercy High School in Westwood. The idea behind forming the Mercy Education Collaborative of Cincinnati is to maximize student learning opportunities and help move both schools ahead more aggressively, effectively and expeditiously. “The Sisters of Mercy are in the unique position of having two high schools in Cincinnati, each with a strong college preparatory program, extensive facilities and loyal alumnae and supporters,” said Sister Doris Gottemoeller, president of the MECC. The new $4 million McAuley Centre at Marist Regional College, Burnie Tasmania, was officially opened and blessed by Archbishop Julian Porteous on 18 March. Marist Regional College is an independent co-educational dual charism Catholic secondary school, catering for young people from Year 7 to Year 12, situated on over 17 hectares, overlooking Bass Strait. The college was founded in 1972 from the amalgamation of Stella Maris Regional Girls’ College, run by the Sisters of Mercy, and Marist College run by the Marist Fathers. The last Sister of Mercy, Kathleen O'Brien rsm, concluded her service at the college in 2011. In his speech, Adrian Drane, Principal, traces the contribution of Catherine McAuley to education and of the Sisters of Mercy to education in Burnie while the camera takes us on a tour of the outstanding facilities. A video clip of the speech is linked to this item (04:25). Editor: This addition, together with McAuley Place, a street in Invercargill, Aotearoa New Zealand, takes 'Catherine's list' to 141 places. Marist Regional College is this week's featured website. Editor: This month is National Poetry Month in the United States. It follows upon the UNESCO's World Day of Poetry celebrated on 21 March. We are grateful to Mary Wickham rsm (ISMAPNG) for resuming her reflective offerings on poetry this month. As Michael Leech wrote in NCR online last week, 'Poetry is theology leaping out of the file cabinet and into the heart. It is the Word or words that stir our souls'. May this reflection on George Herbert's 'Love' open up its meaning for us so that, in Sr Mary's words, the poem will 'be for us a blessing'. Herbert's poem and Sr Mary's reflection are attached to this item. Editor: We invite you to share with our readers from your Lenten reflections. Giving a presentation soon? This post provides suggestions for avoiding some of the most common mistakes made by inexperienced presenters when delivering to an audience. This booklet presents a small sample of the extraordinary work done by Sister Clare Augustine Moore during the early decades of the Congregation of Mercy. On 27 March, Christian Aid UK published a new report showing the devastating effects of climate change, with communities worldwide, particularly in worst hit poorer countries, being forced to change their way of life.